From edgy to classy and everything in between, spiky hairstyles for men have it all. Depending on the way you decide to style your spikes, your hairstyle can take on a whole new personality. Consequently, this is one of the reasons why spiky hairstyles have maintained a top spot among trends throughout these years. Find out which one you should get below! Are you a guy with medium-length hair? You’re among the lucky ones when it comes to styling possibilities. You can spike your hair in a variety of ways, starting with this bold and eye-catching style. 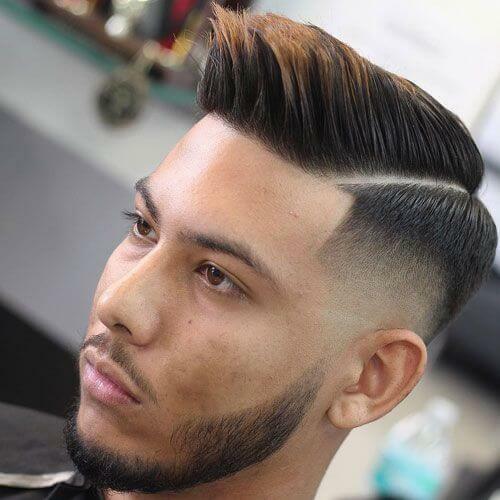 The taper fade helps shape the rest of the hairstyle. David Beckham is certainly a celebrity to keep your eye on for hairstyle inspiration. In this photo, you can see how he rocks a spiky bangs hairstyle, with the hair along his temple brushed up and slightly to one side. 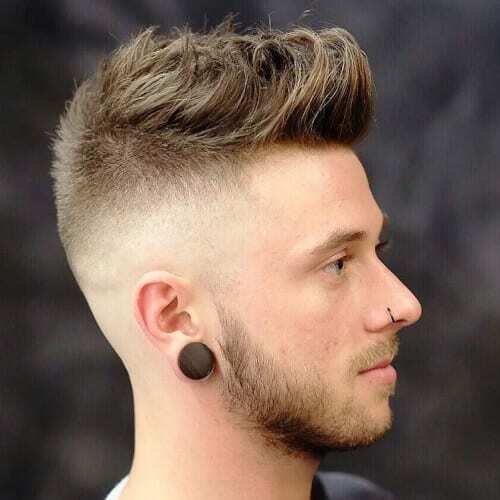 An undercut can truly work miracles for any spiky hairstyles for men. 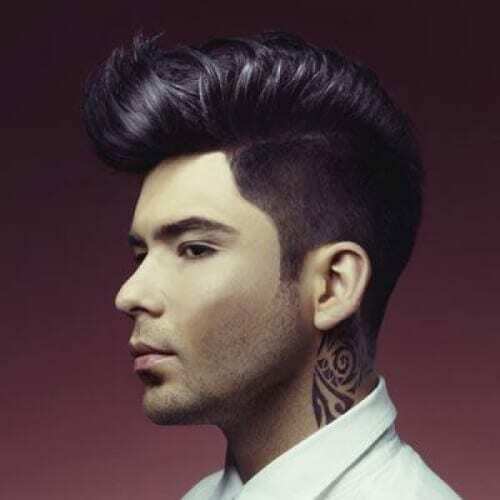 Just like with any taper fade, an undercut allows you to accentuate the upper part of your hairstyle. In this case, we’re talking about the spiky strands you want to draw attention to. The exact texture of your spiky hairstyle really depends on the amount of hair product. For example, if you want a sharper look, we recommend using a little more gel than you normally would. It looks great with short haircuts. 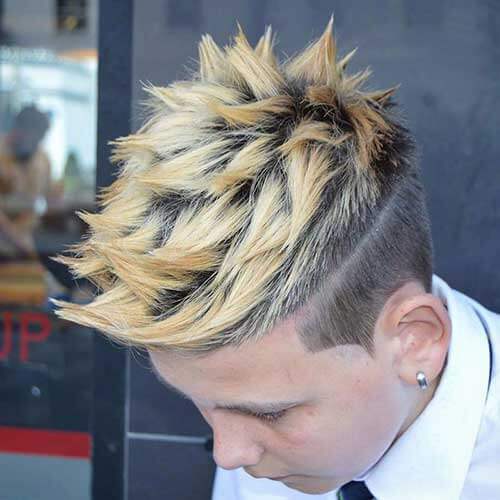 Above all, spiky hairstyles for men are most popular among teenage guys. For years on end, young male pop celebrities like Justin Bieber have been setting hair trends. As a result, any teenager can rock a spiky hairstyle and look awesome. If you have significantly long hair, it may be a bit challenging to spike it. However, you can take the main technique and adapt it to your hair length. In this regard, you should slap on a fair amount of product and style your hair up and to the side. Similarly, you can create your spiky hairstyle with a “swirled” effect. In other words, you can twist individual strands into spikes at an angle. You will obtain a more dynamic hairstyle that goes well with a rebellious personality. Some guys look a lot better when they have their hair parted to the side. Even when talking about spiky hairstyles for men, a hard part can help bring the entire look to life. After getting your hard part, spike your hair sideward. There are numerous ways you can sport a faux hawk. For our first example, we’ll be displaying a nice idea for guys with thick, mid-length hair. By styling this type of hair into a faux hawk, you will get lots of volume and definition. While some guys want their hair to have a silky texture, others want to stick to a coarse touch. To get the results you’re looking for, you should use a tiny amount of hair product and rub it between your fingertips before applying it only on your strands. Just like faux hawks, mohawks also come in all different shapes and sizes. 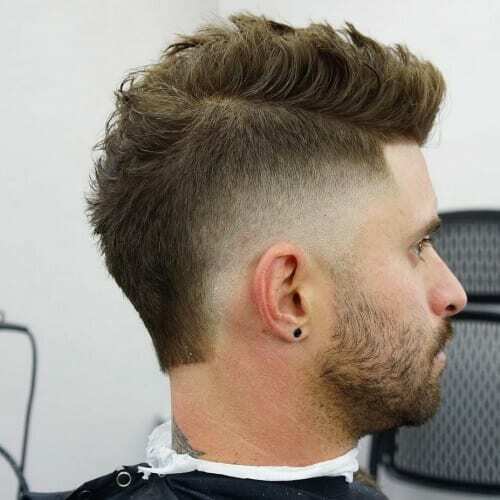 If you’re seeking a mohawk that will be suitable for day-to-day situations, you should try this wide and lightly side-shaved version. You won’t get in trouble for it at school or work. 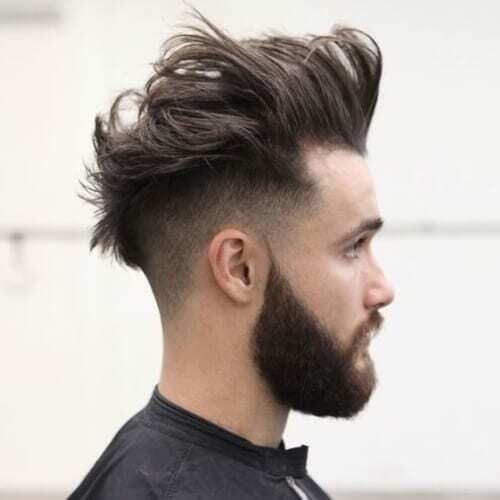 Nowadays, the most fashionable spiky hairstyles for men aren’t as jagged and pointy as they were ten or twenty years ago. Quite the contrary – they focus on messy styling more than anything. With this detail in mind, think about rolling up your locks as you spike them. The same goes for men with curly hair. 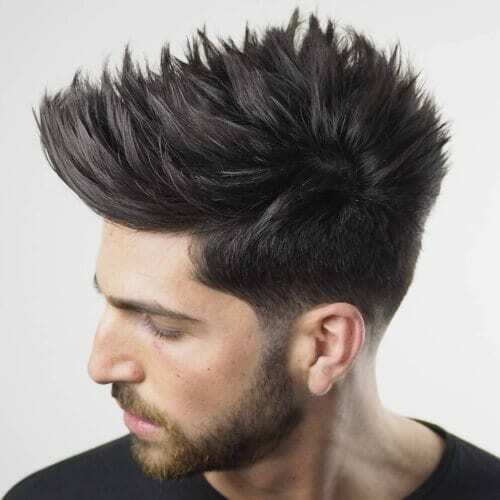 Owing to your hair texture, you’ll have a hard time fully spiking your hair in the traditional sense of the style. Instead, you can twist your curls to get a harmonious style to complement your texture. It’s well known that combover hairstyles are quite classy. Nonetheless, you may not want to look like you’re getting ready for a banquet on a daily basis. Alternatively, you can comb your hair to the side and spike the edges for a casual hairstyle. 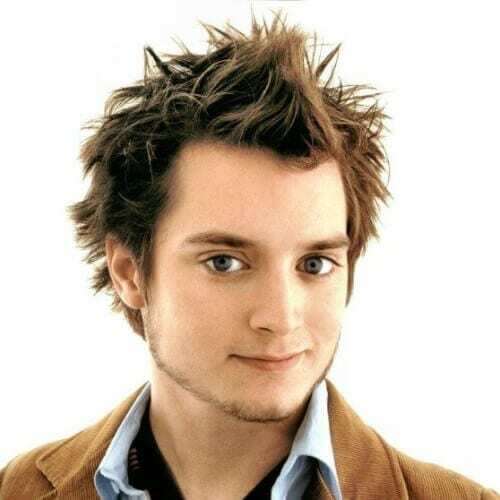 Still, if you’re truly interested in the edgy part of spiky hairstyles for men, you can go all out with your version. There really aren’t any rules with this hair category, as long as it’s an accurate representation of your personality. In saying that, feel free to rock high spikes if it’s your thing. 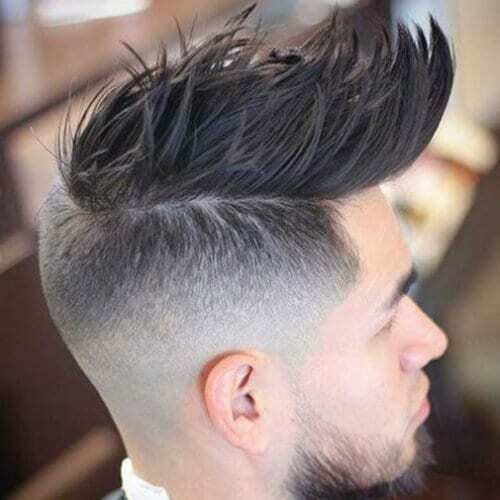 Any man can agree that the quiff has an indisputable spot among the top trends of the year for men’s hairstyles. Be that as it may, you might want to add a twist to yours. As opposed to the sweeping style that comes with the classic quiff, you can spike your bangs. Happily for some but unfortunately for others, spikes and thick locks go together only when the hair is cut short. We say that the combination is appealing and should be considered by all guys with naturally thick hair. 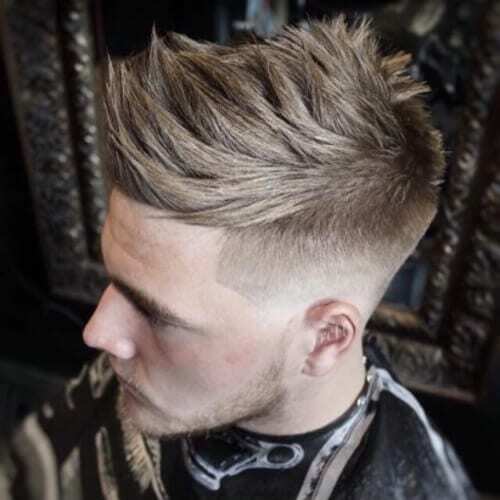 No matter what spiky hairstyles for men are in discussion, layers will always play an essential role in them. 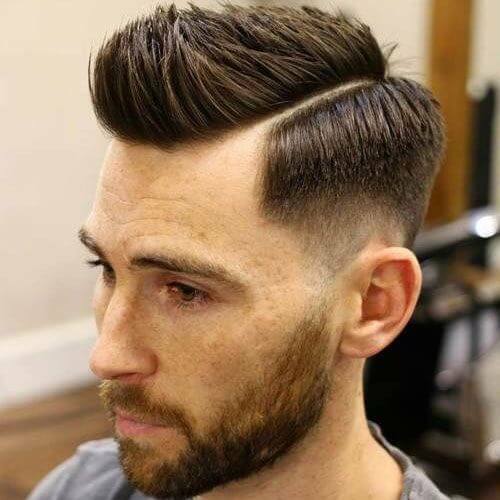 The spikes themselves actually form with the help of a well-layered haircut, so make sure you get one before trying to achieve this style. 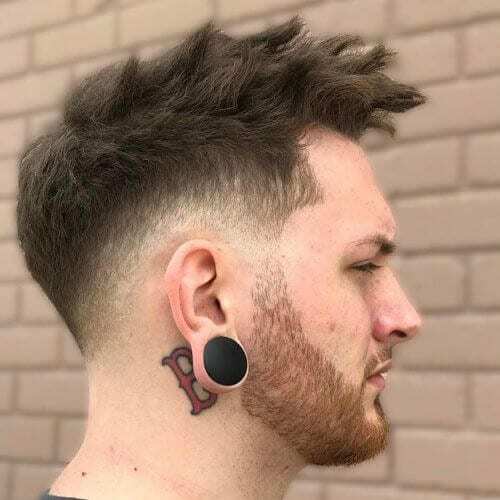 Another cool part about spiky hairstyles for men is that they work with all face shapes. For example, Twilight’s Taylor Lautner shows how a guy with a round face should wear his spikes – ruffled and neatly cropped. In addition to layered haircuts, messy styling methods are also indispensable for spiky hairstyles. 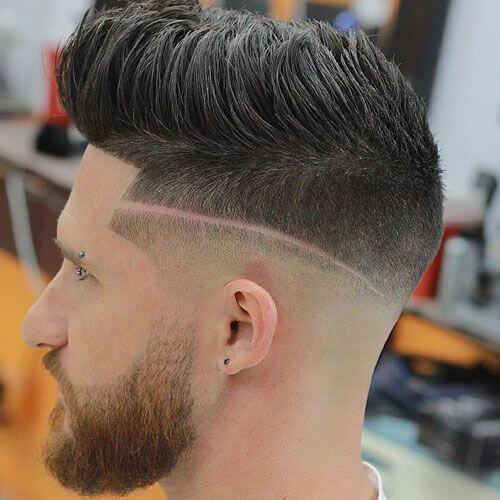 If you don’t have a taper fade or undercut, you can spike your hair all around. It’s a sure-fire way of getting a funky and personality-filled hairstyle. 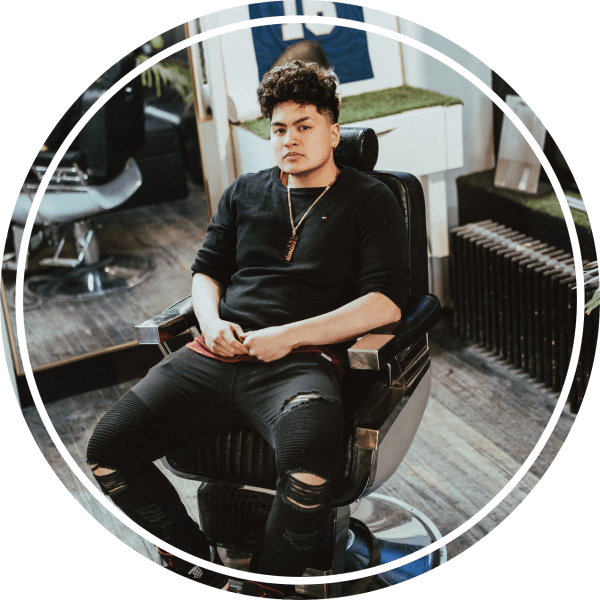 If you’re keen on maintaining proper grooming habits, you’ll most likely be passionate about visiting your favorite barber. Once you get there, you can ask him to spike your hair in the way that best flatters your features. Another idea for a spiky faux hawk is to follow a pyramid silhouette. To put it otherwise, you should bring the hair from both sides together to form a triangular faux hawk. It’s basically like spiking your bangs and the section of hair directly behind them. 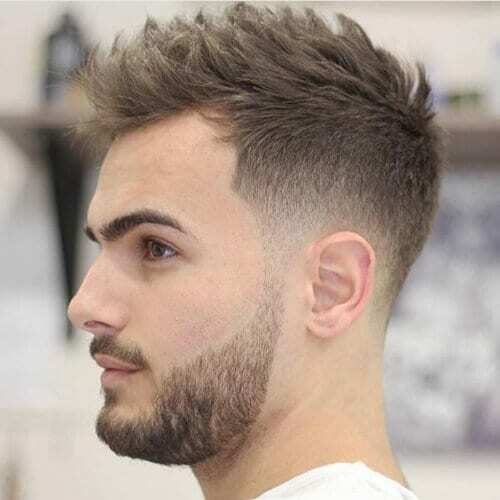 The spiky hairstyle that most effectively complements men with square faces is quite similar to that for round-faced men. 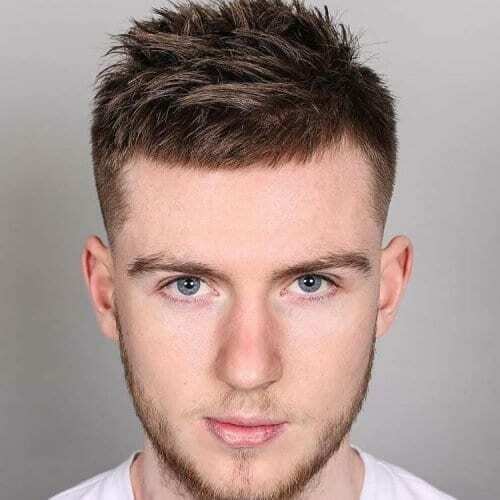 In both situations we recommend keeping a short spiky hairstyle with just enough product to secure the spikes in place. 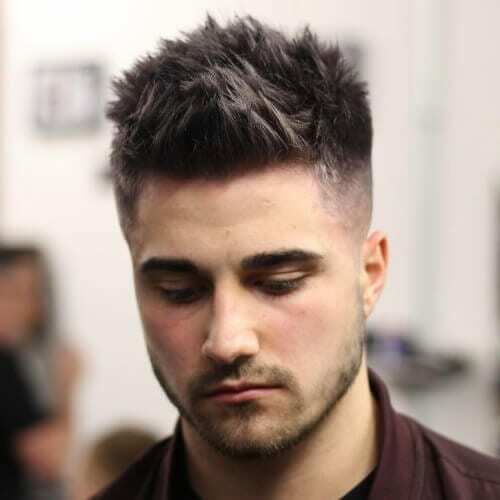 Highlights are an exceptional way to spice up any boring spiky hairstyles for men. 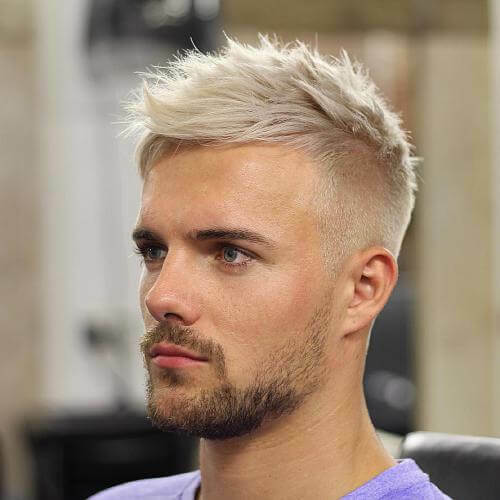 Choosing another color to add to your hair will accentuate the spiky texture you’re looking for even more. We encourage you to explore opposing tones for your desired outcome. If you’re one of our readers with longer hair, you’ll already know that “normal” spikes aren’t that much of an option. Still, they can pave the way for messy bad boy hairstyles inspired by spiky locks. Pull your fingers through your locks and tousle them without a care. 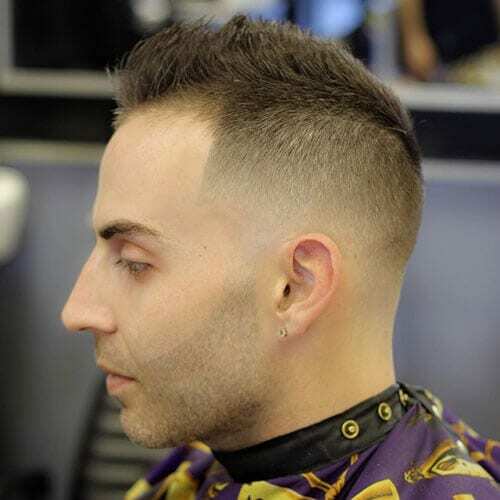 A temple fade haircut tends to add class and attitude to a man’s appearance. When you add a spiky hairstyle to the mixture, you get a brilliant contrast to your overall hairstyle. 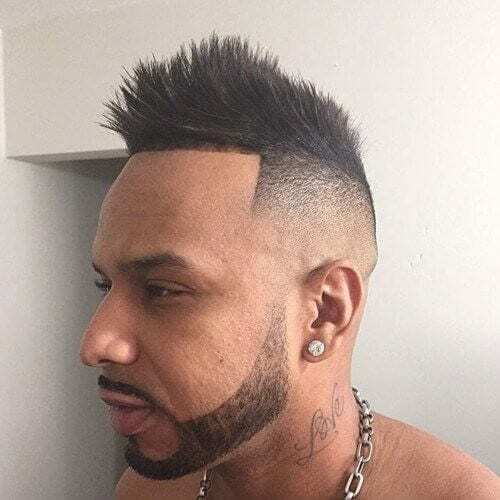 While your hairline is shaped in sharp and clean angles, the top will be coolly disheveled. 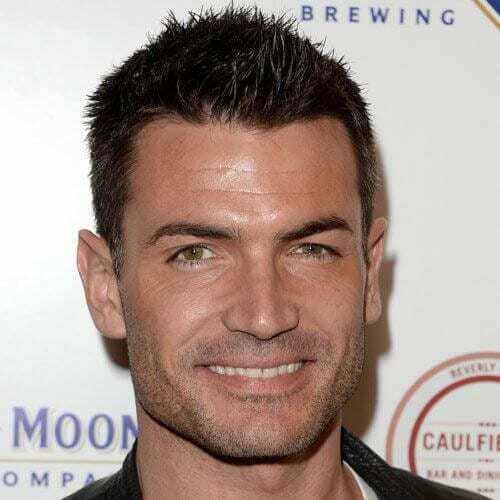 These days, a great deal of spiky hairstyles for men are accompanied by a fade, taper or taper fade haircut. 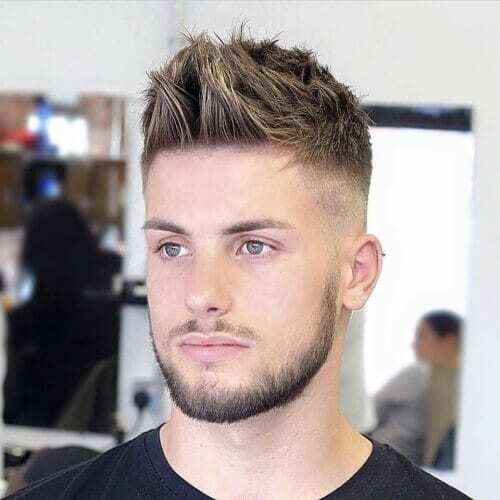 To correctly introduce you to all of the options you can try out, we’ll start with a high fade hairstyle featuring a spiky top. 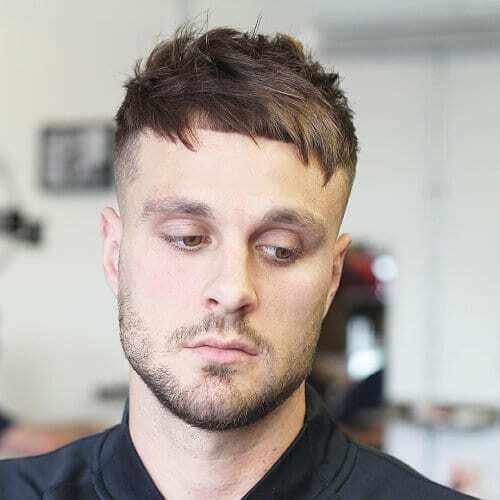 If you want a short hairstyle that’s not quite a military haircut, the angular fringe should definitely be on your shortlist. 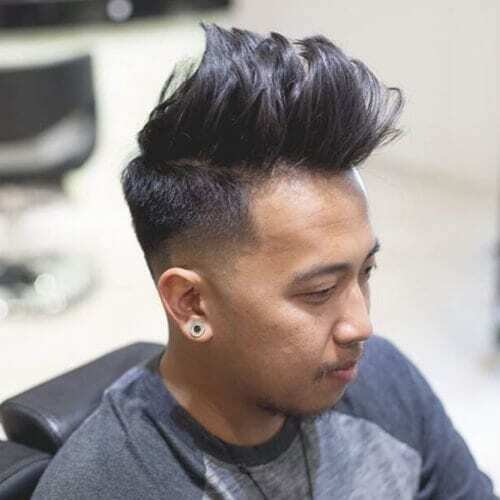 This year, the hipster-like hairstyle has taken the charts by storm for its alluring, gently spiked style. 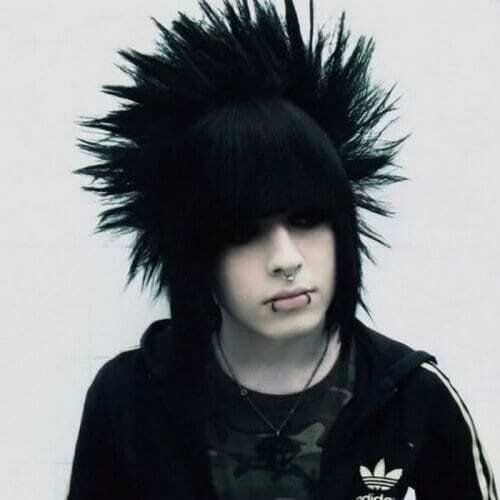 Even though most emo or scene hairstyles are defined by super long side-swept bangs, some of them also involve spikes. Most of the time, the bangs part will be maintained, while the spiking is left for the back side of the hair. Don’t want to go quite overboard with your hairstyle? 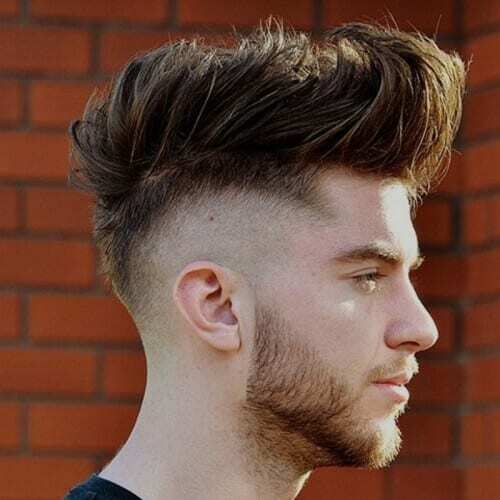 You can rely on a mid fade spiky hairstyle for effortless swag that won’t attract awkward stares. 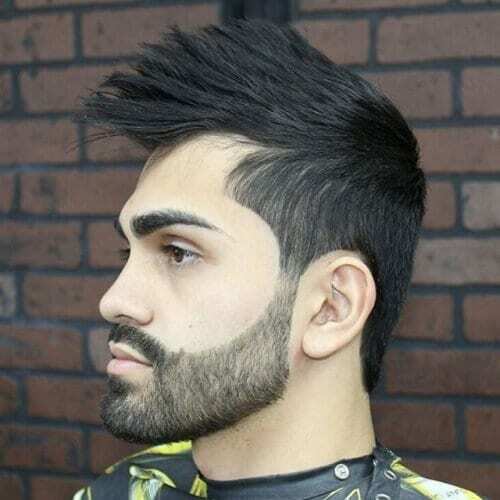 Your version can include a skin fade, like in the example above, or a subtle transition starting halfway down. 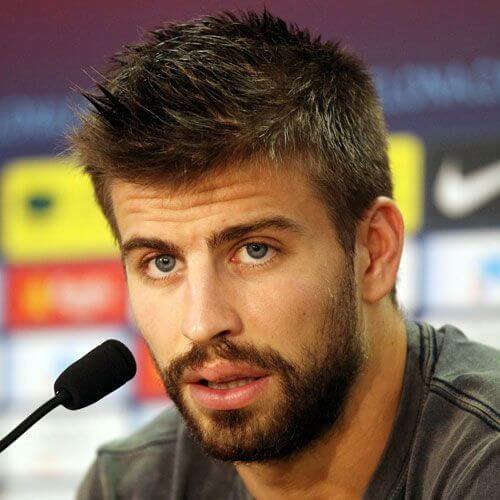 For a rugged and manly look, you may want to consider combining your spiky hairstyle with a beard. Though we don’t quite recommend rocking a scruffy beard, one that is cleanly trimmed will complete your look in a fine way. Spiky hairstyles aren’t only for teens and young men. In fact, they can bring out the youthful side in any man that has reached his senior years. 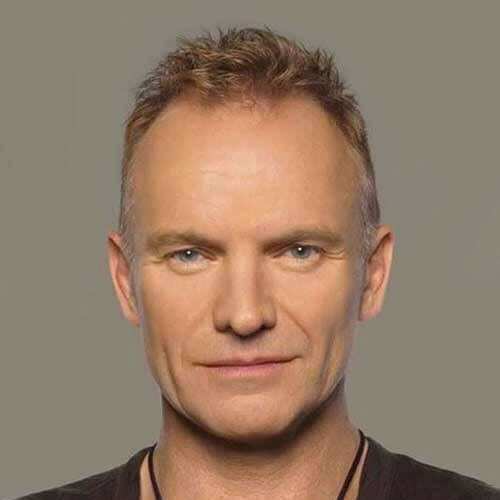 For instance, Sting always seems to remain forever young with a casually spiked hairstyle. Are you interested in finding the perfect balance between classic and modern? There are few ways to do it better than with a spiky pompadour hairstyle. The pomp silhouette will ensure the retro vibe of the hairstyle, while the spikes come in with the perfect contemporary touch. 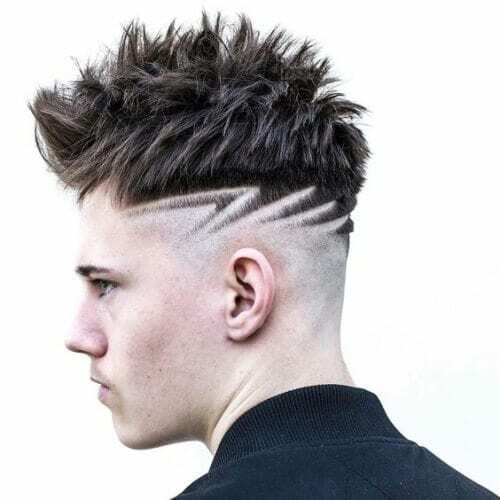 If that’s not rebellious enough for you, test out some shaved designs to make your hairstyle the center of attention. Also known as hair tattoos, complex shaved designs have the power of making your appearance genuinely unique. 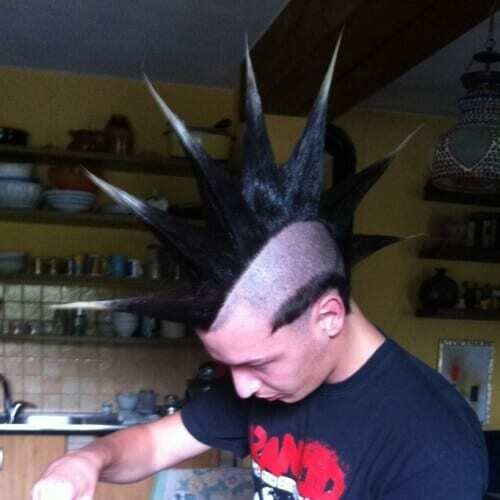 Punk hairstyles may not work for everyone, but they look awesome on guys who follow this subculture. 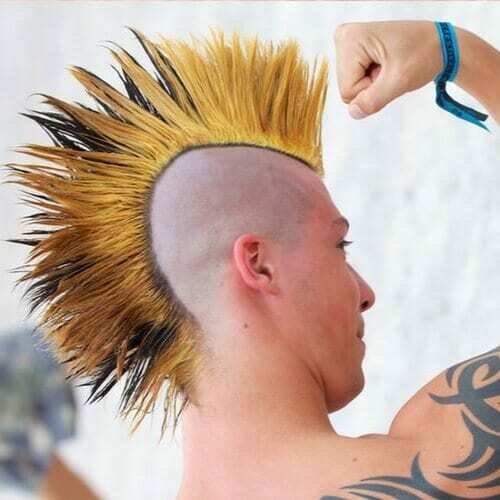 With a fanned mohawk, for example, you can take your spiky hairstyle to a whole new level of creativity. 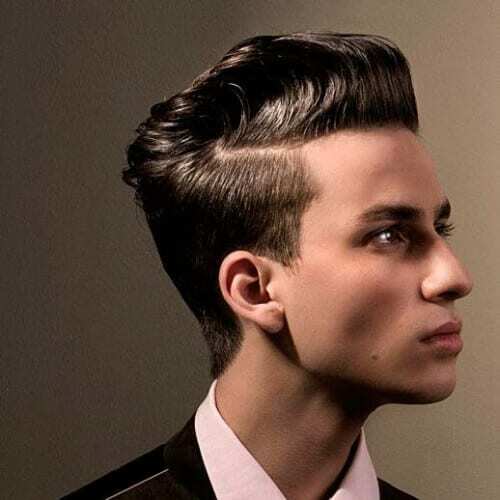 Just like modern pompadours, rockabilly hairstyles are refined and edgy at the same time. A rockabilly hairstyle doesn’t include classic spiking, but rather a styling technique inspired by that used for creating spiky strands. 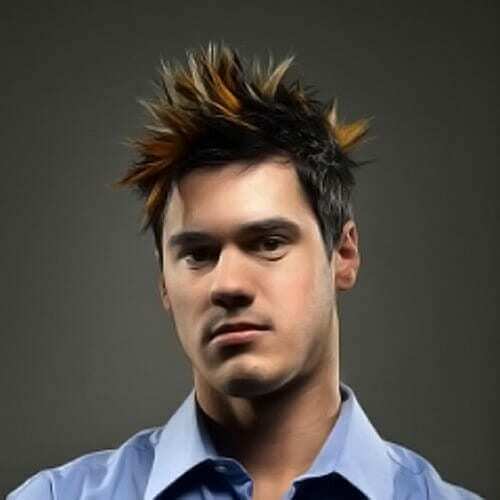 Spiky hairstyles for men also go well with military hairstyles that involve an inch or two of hair. 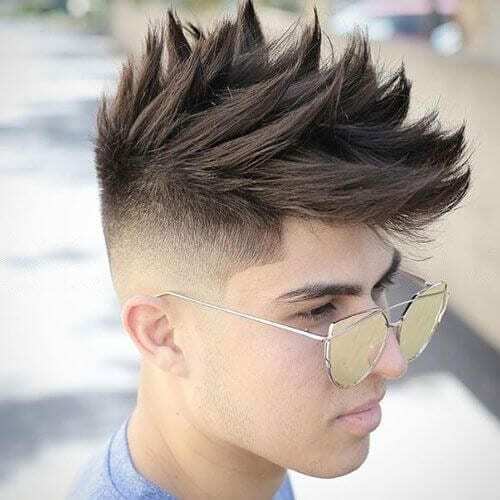 For example, you can take a high and tight hairstyle with anything longer than a buzz cut top and style it in a spiky manner. 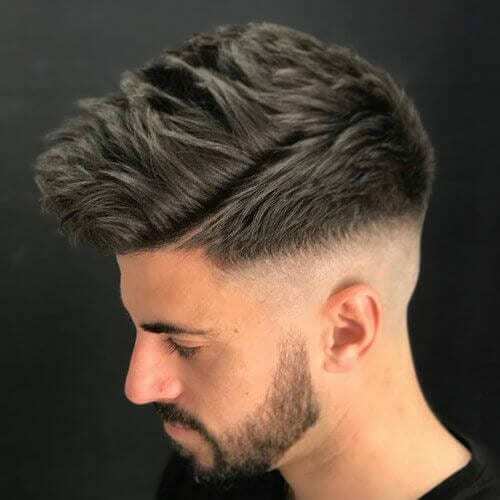 The subtlest of all fade hairstyles is the low fade. 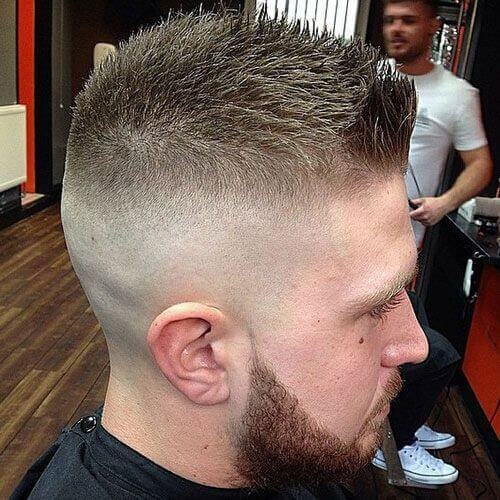 Like the name suggests, a low fade is defined by a gradual transition towards the lower part of the head. We say it’s a wonderful opportunity for a discrete and appealing hairstyle. If your haircut is anything close to a bowl cut, you might not look quite alright spiking your hair all around. However, what you can do is make your hair appear unkempt on top. In this situation, we recommend styling your bangs normally. Essentially, a surgical line works like a hard part, in saying that they both appear as shaved lines in the head. All the same, a surgical line is usually shaven on one side of the head and is slightly arched as it fades at the end. Here’s another retro spiky hairstyle to inspire you. You can notice that plenty of hair gel was used to obtain the look, but for different purposes than regular spiky hairstyles. Instead of using the product to create multiple spikes, the look focuses on bringing all of the hair up and keeping it sleek. 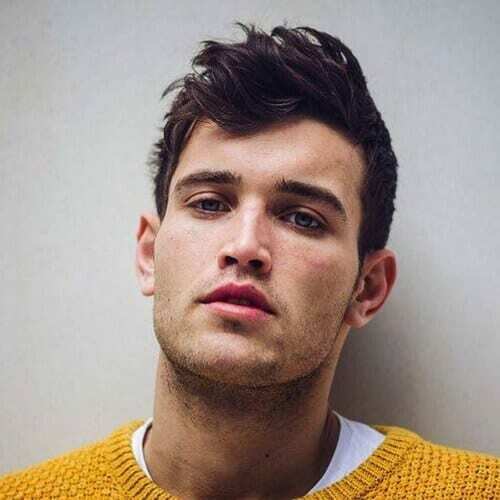 With the right haircut, you can almost say goodbye to visibly receding hairlines for good. A spiky hairstyle can help you accomplish this goal by steering the attention away from the receding hairline and towards the textured top. 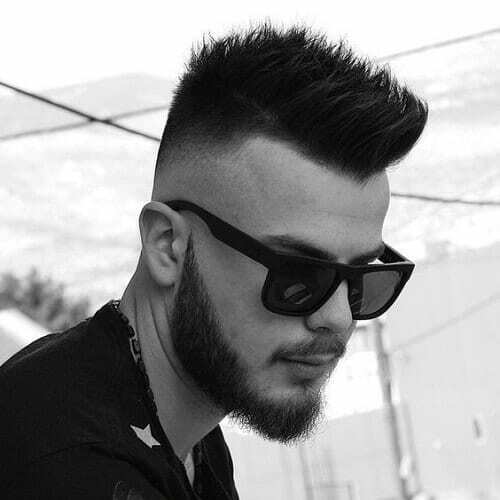 The French crop haircut is easily one of the coolest hairstyles of the year for men. Luckily for you, there are countless ways you can style yours. 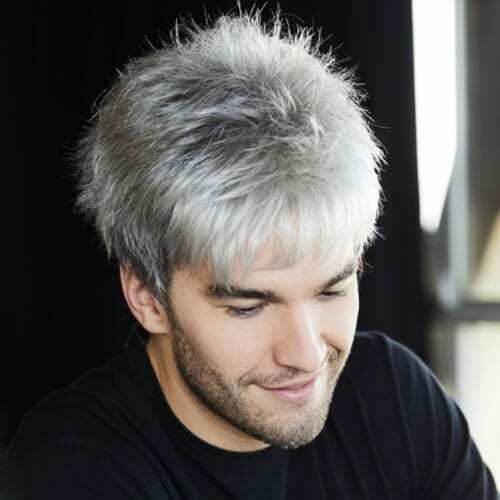 You can spike the top and get the French part done only for a layer of your hair underneath, like in the photo above. 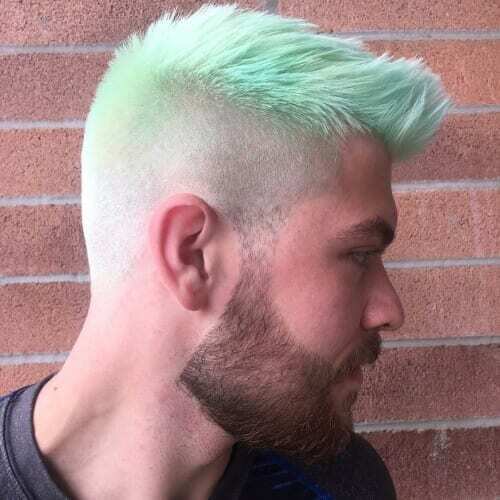 We know it may not be the healthiest solution for customizing your look, but we have to admit that bleached spiky hairstyles for men look awesome. We especially encourage you to approach the idea if it’s summertime or if you’re generally an open-minded individual. 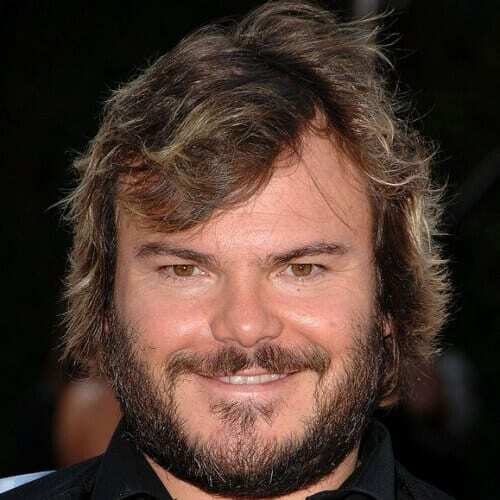 If you know anything about Jack Black, you know that he was never the one for conventional appearances. We love his outlook and want to recommend his take on a spiky hairstyle – with shaggy locks all over the place. Do you want to fully take advantage of your appearance to express your personality? A little bit of color is all that you need. After dyeing your hair with your favorite tone, simply spike the top to make it all look even cooler. If you have afro-textured hair, that doesn’t mean that you can’t find spiky hairstyles that work for you. 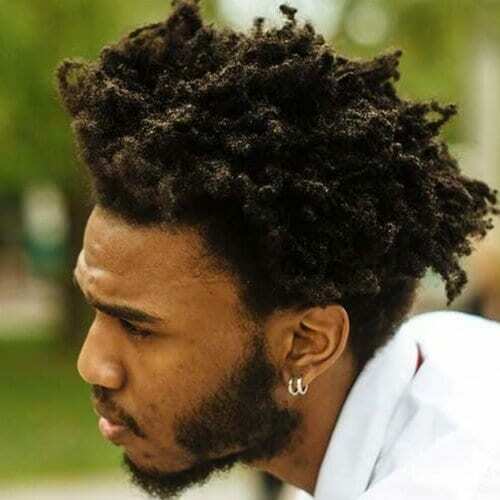 Actually, short dreads look amazing with a spiky, nappy hairstyle. Don’t be afraid to embrace your natural texture whole-heartedly. Want to be extra original with your hairstyle? 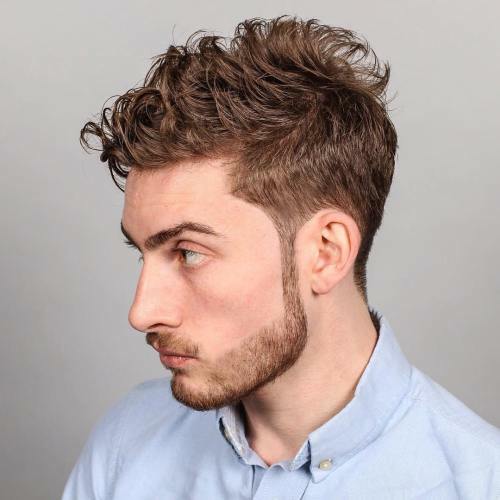 You can use not only one, but two shaved lines for your spiky hairstyle. It’s just another way you can tweak your look to truly reflect your personality, especially if you’re a creative person. Another authentic punk haircut that involves a spiky hairstyle is the dramatic liberty spikes look. It’s obviously reserved for the true punks who aren’t afraid to show their true colors, so go for it if you’re one of them! Finally, you should never neglect your bangs when seeking unique hairstyles. For example, you can complement your spiky top with a set of V-shaped bangs. We say that they would complete the look harmoniously. To conclude, boys, teens, adults and even seniors can all benefit from spiky hairstyles for men. 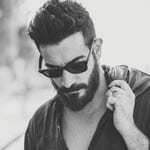 The style category is far broader than you may have initially thought, with a multitude of handsome styles for all kinds of guys. We’ll leave you with some food for thought: if you had to choose just one spiky hairstyle, which one would you adapt to your style?